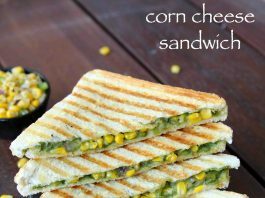 corn sandwich recipe | corn cheese sandwich | grilled sweet corn sandwich with detailed photo and video recipe. healthy and tasty sandwich recipe prepared mainly with sweet corn and grated cheese stuffing. it is a quick and ideal sandwich recipe especially with kids for their tiffin box or lunch box. 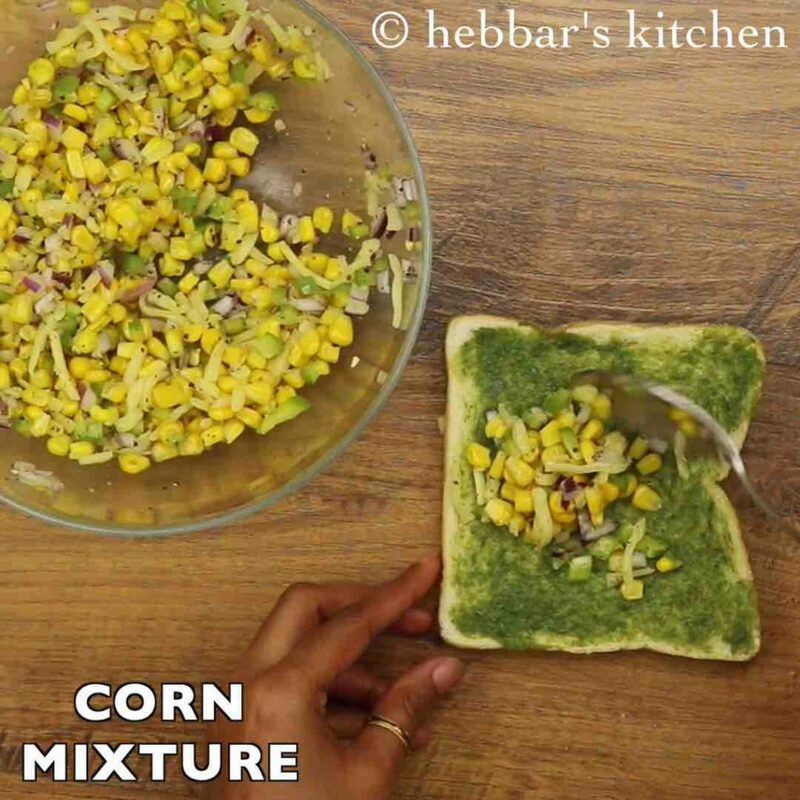 the combination of sweet corn and other spices provides a sweet and savoury taste to this simple sandwich recipe. 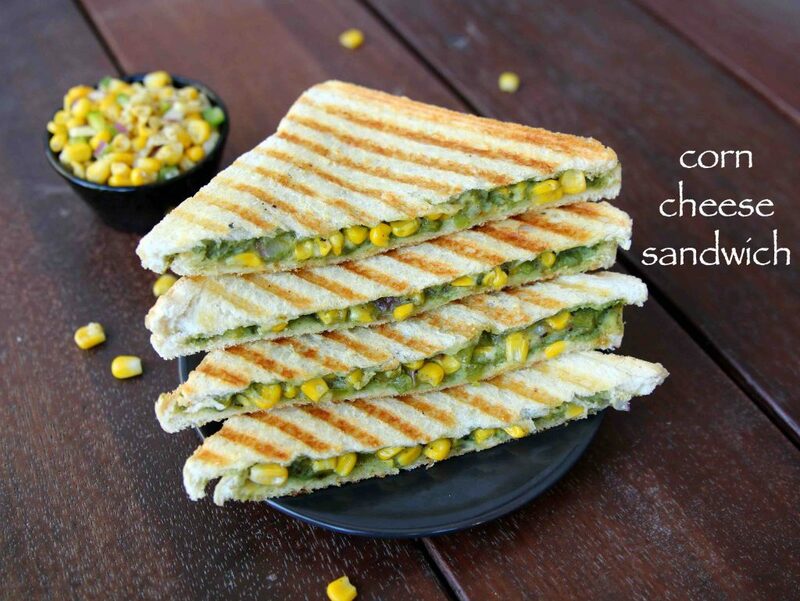 corn sandwich recipe | corn cheese sandwich | grilled sweet corn sandwich with step by step photo and video recipe. sandwich recipes are always simple and healthy breakfast options. generally, it is either stuffed with spiced veggies and meat combination to make it a complete and balanced meal. in this sandwich recipe, the primary vegetable used is sweet corns which introduce sweet and spicy taste to the sandwich. even though the name of this sandwich is dedicated to corn, it still contains other veggies and spices in the stuffing. basically, in addition to sweet corn, i have added finely chopped capsicums, onions with other spices like pepper. moreover, i have even used green chutney as a bread spread with grated mozzarella/cheddar cheese stuffing. having said that it is completely open-ended and can be easily experimented with other veggies like sliced mushrooms, spinach leaves, tomatoes and grated carrots. as a matter of fact, corn spinach sandwich is another popular variant and i am planning to share it with a video soon. 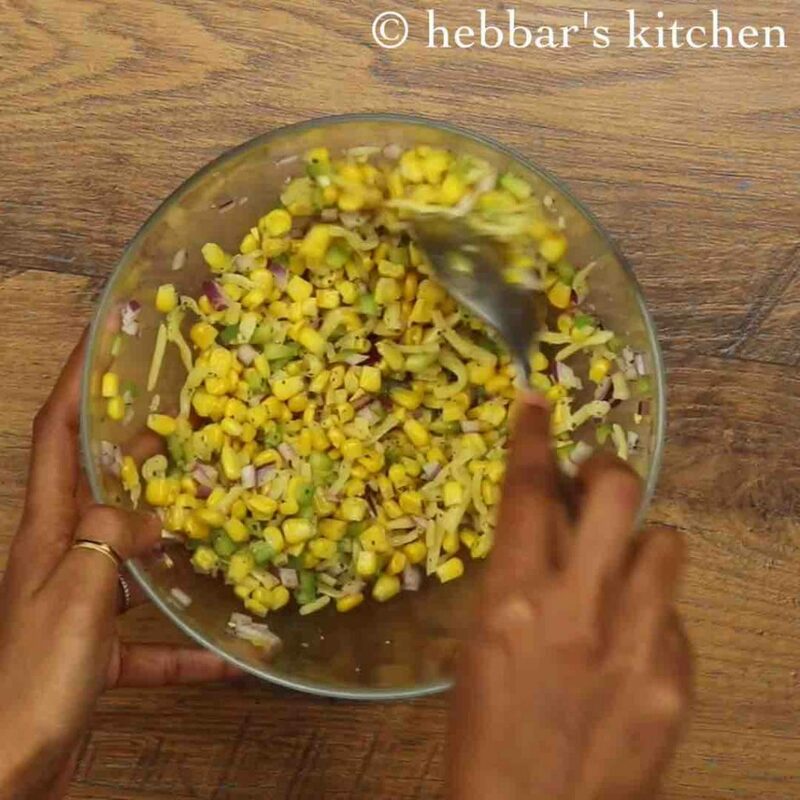 while it only takes less than 10 minutes to prepare corn sandwich recipe, yet some tips and recommendations while preparing it. 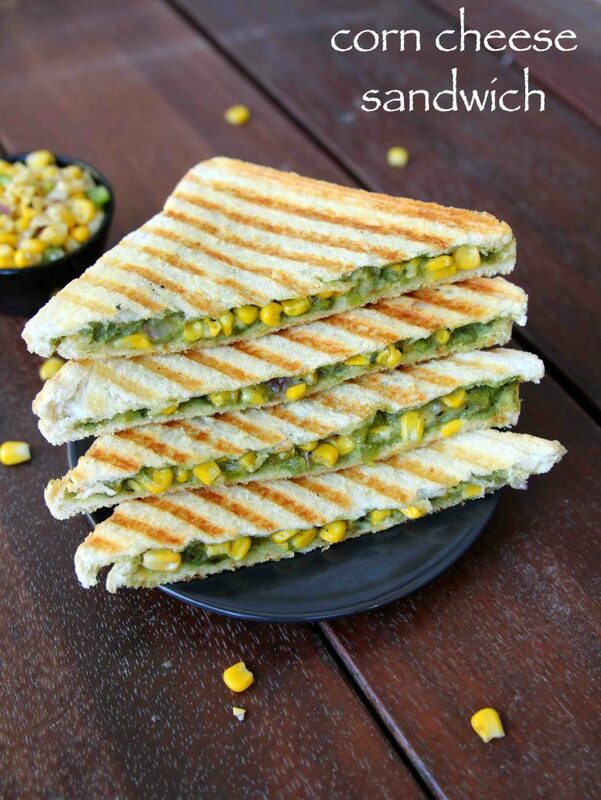 firstly, you can use any bread slices for this grilled sweet corn cheese sandwich. i personally recommend the white sandwich bread or multi-grain bread for best results. secondly, adding cheese is purely optional and can be completely skipped if you do not like it. moreover, you can extend it by replacing it with cream cheese or mayonnaise for a creamy texture. 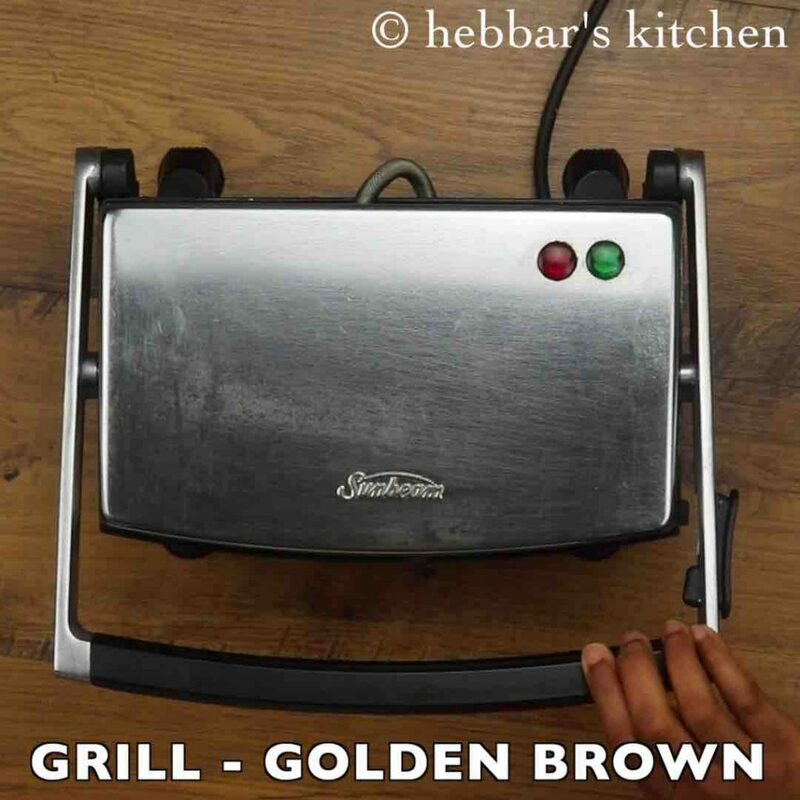 lastly, i have grilled the sandwich in the sandwich grill, but you can also use tawa or tawa grill for the same purpose. in addition, you can also use the sandwich toaster for to prepare corn sandwich toast. 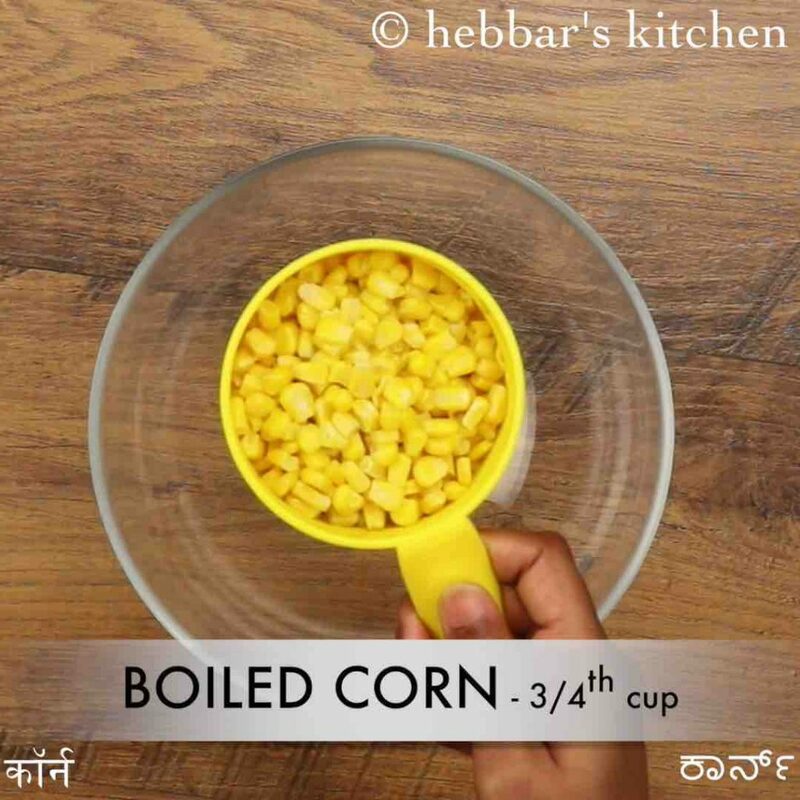 firstly, in a small mixing bowl take ¾ cup boiled sweet corn. also add 2 tbsp capsicum, 2 tbsp onion, ¼ cup cheese, ½ tsp pepper and ¼ tsp salt. mix well combining all the ingredients well. keep aside. 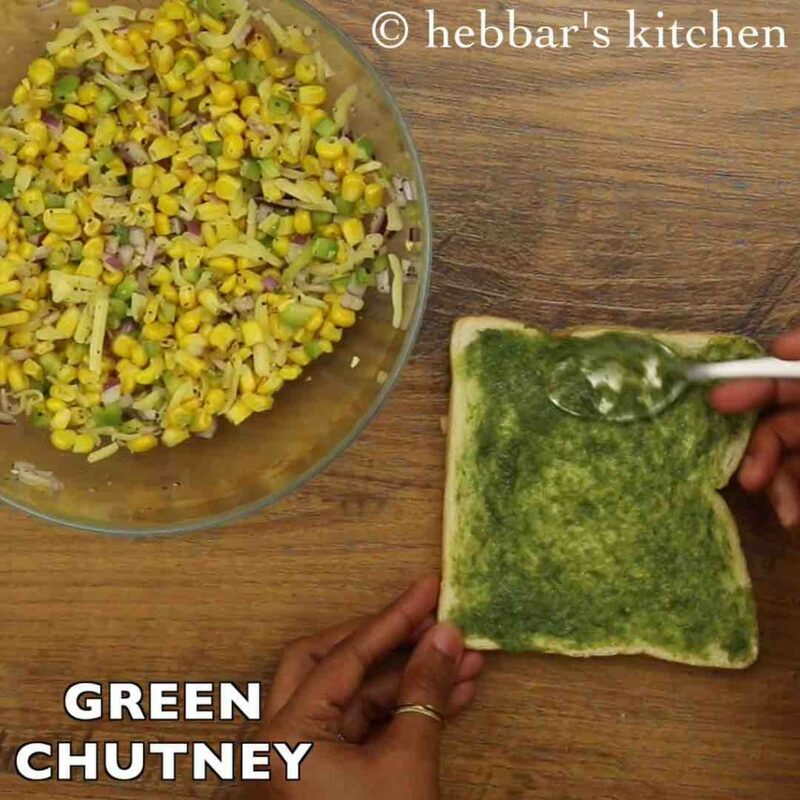 now spread green chutney over a bread slice. furthermore, spread 2 tbsp of prepared corn cheese stuffing. 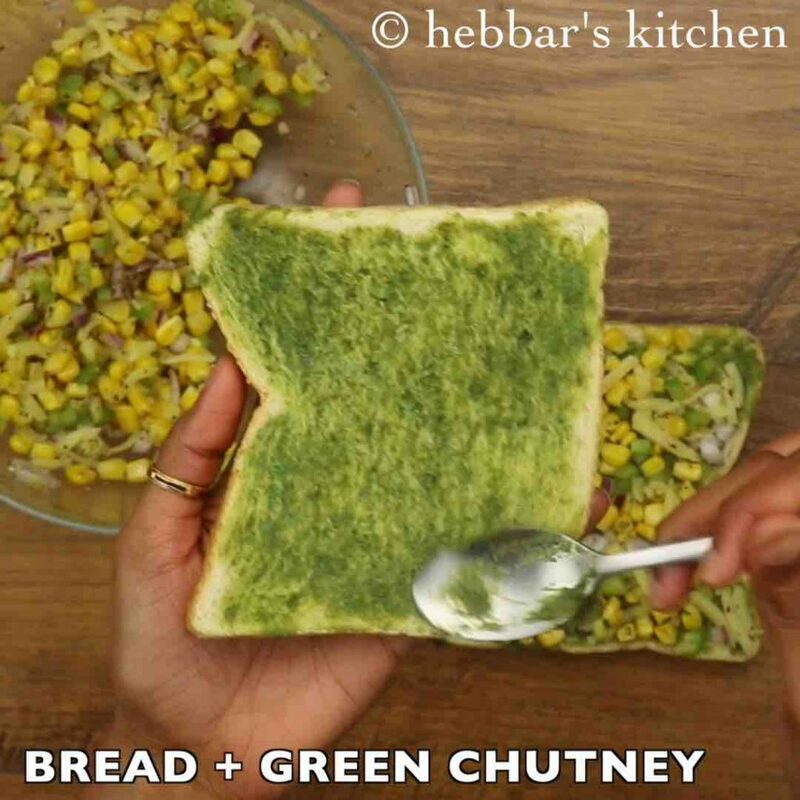 cover again with bread slice spread with green chutney. now grill golden or toast on tawa by spreading butter. 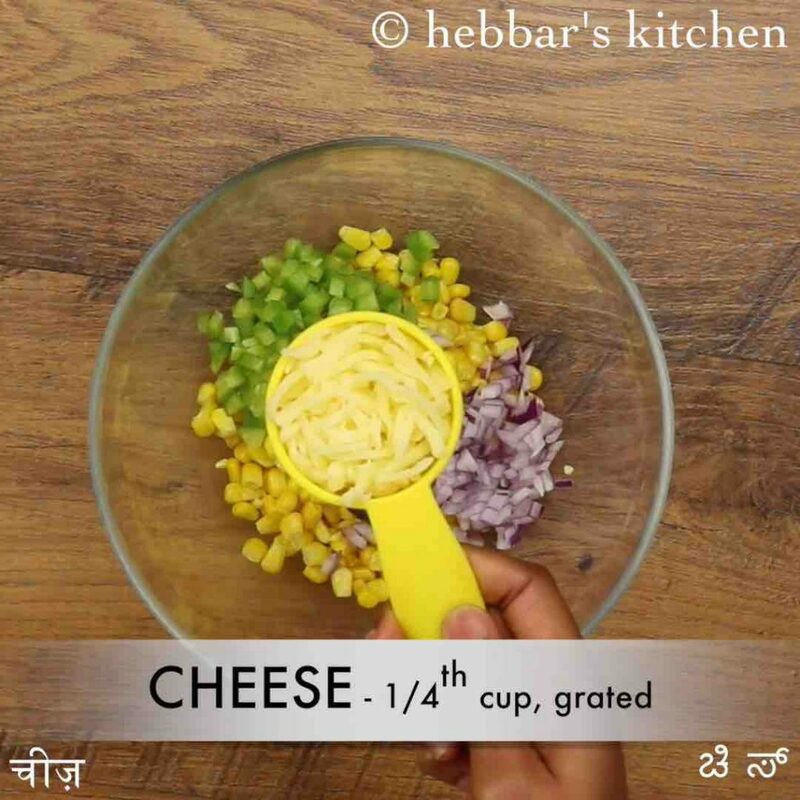 finally, cut half and serve corn cheese sandwich recipe. firstly, add vegetables like carrot, tomato or boiled peas to make more colourful. also, use eggless mayonnaise in place of green chutney if serving for kids. additionally, add finely chopped green chilli for a more spicy sandwich. furthermore, to keep sandwich light skip adding cheese. finally, corn cheese sandwich tastes great when served hot and made more cheesy.